SIGNED POSTER or CD GIVE-AWAY! May 2007: All 7 winners have been contacted by email ! Jan. 29, 2007. 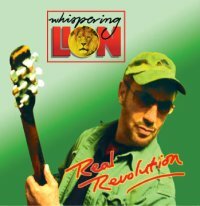 Greetings to all my friends, this is Whispering Lion. and also email us ( wlion@sbcglobal.net ), so we can reach you if you are one of the winners! "My favorite song from "Real Revolution" is.......... because......."
10 winners will be drawn from the received emails.